(00:00) Hello, this is Abigail Lambke again, with the Procedures section for “Arranging Delivery, Delivering Arrangement.” This one is in two parts. The first part covers the artifact and some terms that I’m coining for this webtext. The second part includes further analysis, defense, and some visualization of those terms. (00:23) One of the main objectives of this project was to analyze successful professional podcasts for arrangement and delivery choices and then interpret those results. For this, I needed to almost reverse engineer a number of podcasts and then observe how the data connected between arrangement and delivery. (00:43) A part of my sonic ecology argument is about the theory of podcasting process and how arrangement and delivery overlap in the chronological production of a podcast. But another part—a larger part—is more based in data and interrogates the actual choices that successful professional podcasters have made in creating podcasts. This Procedures section indicates how I went about choosing my artifacts and collecting that data. (01:14) To begin, I needed a series of artifacts to use as a source. I have been listening to podcasts since 2007. In that time, I’ve heard the development of a number of interesting and influential podcasts, but none caught my attention like 99% Invisible, which has entertained me, taught me, and served as source materials for any number of class days. I participated in Roman Mars’, the host of 99% Invisible, his first Kickstarter campaign, and thus have been hearing about the podcast collective Radiotopia since its inception. (02:51) It now has six more (Radiotopia, 2018), although my most rigorous analyses are centered on some of the long-lasting shows. All of the shows in Radiotopia are story-driven and edited and produced. They are all excellent podcasts. (03:06) Radiotopia offers a great deal as a rhetorical artifact for this project. The diverse selection of shows cover different themes and approaches and with them a number of strategies, representing alternate attitudes toward podcast innovation and style. There is also a nice balance of male and female voices across the podcasts, an intentional choice to bring more women into the male-dominated medium of podcasting (Radiotopia, 2014b). But while the shows are diverse, they are uniformly quality story-driven audio productions, with talented and inspired hosts and producers doing good work. (03:42) In creating the project, my initial step was to listen. I selected at least five episodes of each podcast and listened to them over a number of weeks, charting the style of each and getting a sense of the range of each podcast. (03:57) That listening took many hours of dedicated podcast interaction, thankfully with the added benefit of being about to do the dishes, walk the neighborhood, or drive places. I’ve listed each of the episodes I listened to in the blue box on the webtext, alongside quotes referencing Radiotopia values, intentions, funding, and a defense of the term radio in a podcast collective. Once I had listened to a number of episodes, I began to chart the outliers and create my own descriptions of the podcasts. Sponsored by the public media company PRX (Public Radio Exchange) but funded in a large part by the public through Kickstarter, The Knight Foundation, as well as individually through ad revenue, Radiotopia branded itself as a “collective of the best story-driven shows on the planet” as well as a “new model for audience engagement and revenue growth in public radio” (Radiotopia, 2015). In 2014, Radiotopia ran a massively successful Kickstarter campaign, suggesting its value to a significant number of listeners. They more than met their Kickstarter goal of $250,000, ending up with a total of $620,412 from 21,808 backers (Radiotopia, 2014a) This outcome made it the most successful project related to radio or podcasting on the site (Jensen, 2014). Their Kickstarter campaign video, a rhetorical event itself, claimed that Radiotopia is committed to the “best sound-rich story-driven audio programs in the world,” akin to being “an indie label for the best producers to do their best work” (Radiotopia 2014a). But more than just producing quality podcasts, Roman Mars, the creator and host of the flagship program 99% Invisible, has frequently remarked that his goal is to change the idea of public radio, subtitling the Radiotopia Kickstarter campaign “a storytelling revolution” (Radiotopia, 2014a). Still, if this is a revolution, why adhere to the term “radio,” when podcasts remediate radio? The answer is that Radiotopia is about both radio and about expanding the idea of radio. Mars explained as a footnote to Update 7 that the name was coined by Julie Shapiro at the Third Coast International Audio Festival: “Julie called this gathering and all the great plans we had for audio storytelling “Radiotopia.” It’s a place where everything is radio and everything is really good” (99% Invisible, 2013b). Radiotopia as a digital podcast collective makes this somewhat paradoxical. It becomes a place, in an abstract way, to find quality radio, without engaging with anything called a radio at all. (04:29) I also identified two criteria that I wanted to work on for this project relating to the undervalued canons of arrangement and delivery. (04:39) Listening to a podcast is a fairly intimate practice of having a person’s voice in your head, telling you a story, and often using others’ voices and words to do so. I wanted to focus on the podcast hosts for this project, because the host is often an entry point for listener engagement. The host generally speaks first and last in an episode, and is the guide for the story. Their voices, the tonal qualities, cadence, accent, all create an image of the person in the mind, and in this transmission of the voice, leads to connection with the host. With these ideas in mind, I clarified my thoughts into two terms: vocal presence and vocal engagement. (05:27) Vocal presence refers to how much a host is vocally present in an episode. As I said previously, the host is always present at the beginning and the end of an episode, but I was curious, as I listened to the variety of podcasts in Radiotopia, how some podcasters were continually interjecting their thoughts, questions, and comments into the story, whereas some edited the story so that the listener makes those connections themselves without any guidance from the host. (05:56) This I see as primarily a feature of arrangement—for the story to speak for itself, as in an episode of The Kitchen Sisters Present, the episode has to be arranged so that the audience can make the connections, can follow along with the thought process. For shows that have high vocal presence, like 99% Invisible, the episodes are arranged so that the host is there to add commentary, or response, or introduce interviewees, or share the joy of being a part of the episode. Gray: I tried constructing sentences with it for a bit. Like “meet me somewhere at sometime.” So you can do meet me at time because there is an hour emoji for every hour. Places are impossible to say. Zaltzman: So anything that’s not a noun, presumably, is challenging. Zaltzman: Maybe Matt just wasn’t ambitious enough in his emoji compositions. (07:20) In this clip, you can hear Helen Zaltzman interviewing people about a topic and also introducing narration that connects interviews together. Thus, she is a very vocally present host, scoring high on my vocal presence spectrum. These audio productions you’ve been listening to alongside this webtext are also very vocally present because that is part of my ethos as an academic in creating these audio productions is to showcase my guidance through my arguments and ideas. DiMingus: We have people who sell corn, put sour cream, chili, lemon and mayonnaise. My name is Norma DiMingus. Right around 4 o’clock there’s a lot of business. Unknown: Fridays and Saturday nights I have a DJ outside and he’s jamming and playing music. Kinda a place to be seen. (09:12) Here you hear three voices and two songs, but you infer the transitions yourself, without the guidance of the Kitchen Sisters, who are vocally hidden, scoring low on my vocal presence spectrum. (10:55) The Kitchen Sisters’ decision not to narrate their show, or to be vocally hidden, was not only devised during the process of production and editing but it was also a decision based on medium. They compare it to cinema, but this is also more intimate, with the speakers almost speaking directly to the listener, without the intervening voices of the hosts. To see the range of choices of arrangement, please see my chart locating 13 podcasts from vocally hidden to vocally present. (11:25) Vocal presence is the first of the terms I invented for this project. (11:31) The second is vocal engagement, referring to the performative delivery of the host’s voice. This has to do with tonal qualities, with how the voice, in Quintilian’s terms, has been used (pp. 604–605). Different voices produce different effects. And, a casual read of comments in iTunes about podcasts will give you a sense of how voices are crucial to podcasting, just as they are to radio. (11:54) Listening to and evaluating a voice is admittedly a subjective practice. Some people just can’t stand certain vocal tics, like vocal fry, uptalk, high tones, low tones, slang, or a slow pace. So, in my evaluation of voices, I wanted to choose something that was less pejorative and clearly a choice that the podcaster is making, not necessarily a feature of how their body might make their voice. So, I’ve chosen vocal engagement, referring to the amount of enthusiasm a host’s voice carries toward the subject material. I mapped this on a spectrum from detached (low vocal engagement) to enthusiastic (high vocal engagement). You can see the chart in this section. Mars: I love that. I could listen to that all day. In fact, let’s hear it again. (13:45) Now, 99% Invisible is a show broadly about design, not just sound design as my examples would seem to indicate. They just worked well for this piece, and I like them. You can tell Roman Mars is really engaged and is having fun with what he’s doing. Indeed, last year, in 2017, he won best host voice for podcasting (Webby Award, 2017). You can tell why. (14:50) The vocal choices in performing the voice are rhetorical ones. You choose what you want to sound like, in some measure. In my description of enthusiastic I was enthusiastic, and in my description of detached I tried to sound objective. But, anyone with a vocal range can sound either way, so the sound of delivery, the performance of delivery, is an intentional choice. (16:55) This skirting of moral boundaries might influence his vocal delivery. Indeed, some people who serve as subjects on Love + Radio, and it is a people-oriented show, they’re difficult to accept. This is a place where we see invention, or the idea or topic of a show, also impacting its delivery on a secondary level of ecology. (17:17) These terms—vocal presence and vocal engagement—can also map on to other rhetorical canons. They can come from invention, as I just indicated. They result in different styles of podcasts. And just like writing, listeners might have a preference for one style, topic, or another. But for me, these are fundamentally intertwined with arrangement through the audio production process and as well as delivery through the performance of the voice. (17:45) These choices about arrangement and delivery are rhetorical ones that podcasters make when considering what they want their piece to be and who their audience is. 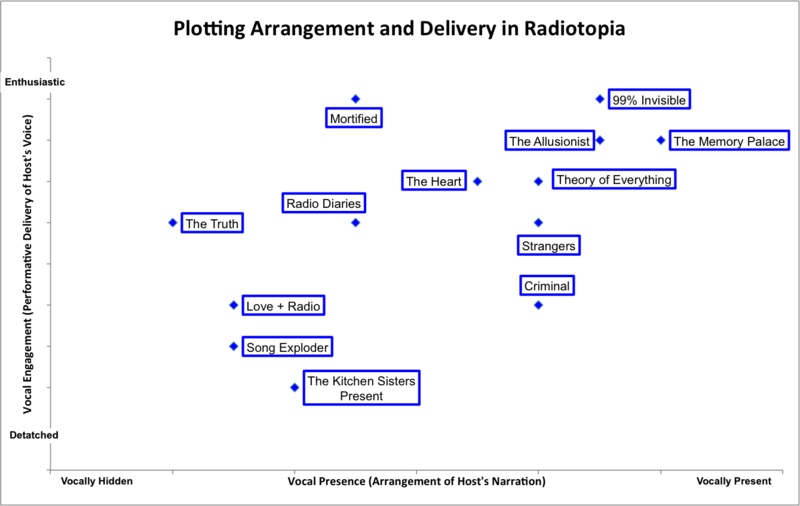 But, interestingly for this study, there are patterns when you take all of Radiotopia between the choices being made about being vocally present and the choices being made about being vocally engaged. (18:06) In the next audio piece on Procedure, I’ll provide a visual display of these terms and a further defense of them. Please take a moment to examine the visuals presented and then press play on the next audio section. Thank you for listening. (00:00) Welcome back to the procedures section of “Arranging Delivery, Deliverying Arrangement.” This is still Abigail Lambke. (00:09) In the previous audio, I provided a few examples of vocal presence and vocal engagement. In this section, we’ll go deeper into both terms and I’ll explain and defend my analysis of the podcasts in Radiotopia according to those two concepts. This section involves much interplay between audio and visuals. I might be referencing aspects that are arranged and delivered sonically in the podcasts, but I’ve used the affordances of maps and charts and sonic visualizations as evidence for my arguments. Like much of this webtext, it is not essential for the argument to both hear and see, but doing so rounds out the argument to its full extent. (00:56) Both of the terms I’ve isolated for my argument—vocal presence and vocal engagement—center on the host or hosts of the podcast. This focus privileges the vocal rhetor at the front of the podcast and has much to do with vocality. Many podcasts are composed collaboratively, but the host is often the first sonic element the listener engages with and can be a make or break element of the podcast. The host’s sonic performance of identity shapes the podcast as a whole. This identity is rhetorically delivered through the questions posed, the tone of voice, personal details revealed about the host. But the host’s sonic identity also connects to arrangement, how much the host is there, guiding you through the ideas. (01:46) When considering arrangement, I could have gone a number of different directions. I could have mapped the development of story, how much music is used, the presence of sound effects, or the order and variety of interviews. (02:02) Instead, when considering arrangement, I focused on how frequently the host is present narrating the show for three main reasons. First, because it is something that is generally consistent across a podcast series. The collaborators of a podcast make a choice if they want their podcast to be more or less narrated, and that's a rhetorical choice that is influenced by and influences the other rhetorical canons of invention, style, and as I argue most in this webtext, delivery. (02:36) Second, the focus on the host overlaps with my focus on the host’s voice for delivery. Thus, my analysis in this webtext is centered on two aspects of one sonic element, the host's voice. (02:50) Third, focusing on vocal presence of a podcast host is something that can be tracked and compared across podcasts. (03:03) I’ll direct your attention to the blue boxes, where I’ve provided evidence from three podcasts from different places on the continuum of vocal presence, which stretches from vocally hidden to vocally present. On the vocally hidden side, I’ve analyzed the episode “Hidden Kitchen’s Texas” from the podcast The Kitchen Sisters Present (2015). To demonstrate a middle ground, I’ve analyzed the episode “Jordan: Jurassic Park Fan Fiction” from Mortified (2015), and to demonstrate the vocally present end of the continuum, I’ve analyzed the episode “All in Your Head” from 99% Invisible (2015). Podcast: The Kitchen Sisters Present (2015). Episode: “Hidden Kitchens Texas.” My analysis places this podcast low on the vocal presence spectrum. Podcast: The Mortified Podcast (2015). Episode: “Jordan: Jurassic Park Fan Fiction.” My analysis places this podcast in the middle of the vocal presence specturm. Podcast: 99% Invisible (2015). Episode: “All in Your Head.” My analysis places this podcast high on the vocal presence spectrum due to both amount and frequency of presence. (03:44) For each, I used Sonic Visualizer (Cannam, Landone, Sandler, 2010) to layer a waveform of sound atop a spectrogram of the sound. Then, I edited in a horizontal line to represent when the hosts are audible during the episode. For The Kitchen Sisters Present this line is yellow, Mortified’s is pink, and 99% Invisible's is pale green. I also included percentages to indicate the amount of the episode the hosts were vocally present, both with preliminaries like sponsorships and introductions, and then percentages that exclude those. (04:23) Comparing both the lines and the numbers between the episodes is evidence for where I’ve placed these podcasts on the continuum of vocal presence. The Kitchen Sisters are vocally present for 18% of the episode, Dave Nadleberg, the host for this episode of Mortified, is vocally present for 22%. But if we take out preliminary introductions and sponsorships, the Kitchen Sisters are vocally present for 9% and Nadleberg for 18%. In constrast, Roman Mars is vocally present for 28% in a version of the episode that does not have those preliminaries. (05:00) Numbers might indicate where they fall on this continuum. But, those numbers do not tell the whole story. Vocal presence is not only about quantity. Instead, it also encompasses frequency of narration. In comparing the sonically visualized representations, you can see not only do the Kitchen Sisters speak less of the total time of the episode, but there is also a long gap during which they do not speak. (05:26) In the episode from Mortified, a significant portion of the episode is Jordan in front of a live audience reading the script he wrote in an imitation of Jurassic Park as a young boy, with an interview at the end of the episode. Nadleberg, the host, speaks at the beginning and with frequency at the end, but there is that long section in the middle during which he is vocally hidden. (05:51) Both of these contrast with 99% Invisible, during which Mars speaks throughout, in short clips, vocally present throughout the episode. (06:02) Admittedly, these represent just one episode from 100-plus collection of podcasts episodes. I am not claiming that these exact numbers would apply to every episode from the respective podcasts. Indeed, the ebb and flow of a podcast over time is one element that makes the podcast series an interface while each episode is essentially a static text. Still, I stand by my placement of the podcasts regarding the vocal presence criterion after listening to a number of episodes across their existence. 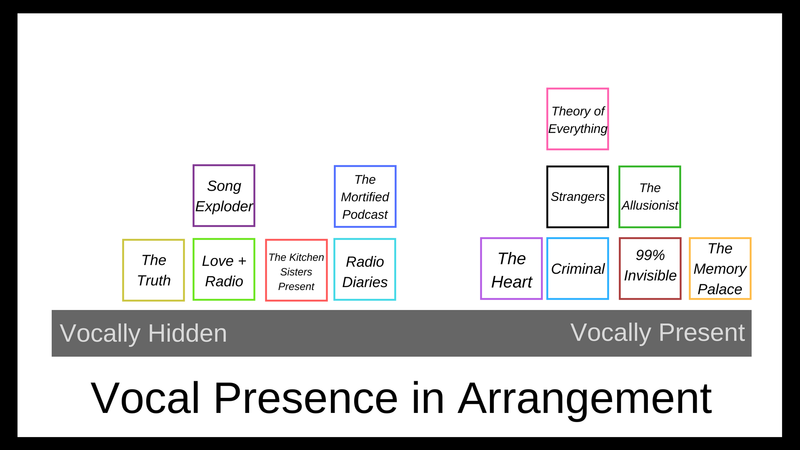 (06:36) With that caveat, I’ll direct your attention to the Vocal Presence in Arrangement chart in the blue box, where these 13 podcasts have been placed on a horizontal axis from vocally hidden on the left to vocally present on the right. The three most vocally hidden include The Kitchen Sisters Present, The Truth, and Song Exploder. The three most vocally present include The Memory Palace, where Nate diMeo speaks the entire time, The Allusionist, and 99% Invisible. The remainder of the podcasts fall in the middle. This chart visualizes 13 Radiotopia podcasts on the continuum of vocal presence. There is a spread across the continuum, with just over half of the podcasts placed on the vocally present end. (07:15) Let’s move to delivery and vocal engagement now. When analyzing a podcaster’s delivery, I could have concentrated on the transmission of the podcast—its vocal cues in an app or on a website—or on the status of the audience when the podcast is delivered. But I chose to focus on the host’s voice because the tonal qualities of a voice are not only important to the listener, they also match an emphasis on the classical canon of delivery. (07:45) At the head of each page in this webtext, you might have noticed the epigraphs from Aristotle, Cicero, and Quintillian. These are nods to the classical heritage of the Western rhetorical tradition, which guided Brooke’s (2009) analysis that I extended in my argument, and my own understanding of how rhetoric functions. In antiquity, delivery was a combination of voice and gesture. Both radio and podcasting strip the gestures and focus on the performance of a voice. (08:20) My focus on vocal engagement in delivery honors that performance alongside classical rhetoric. But just as there are many aspects to consider when thinking about delivery, there are many aspects to vocal performance. (08:35) For this webtext, I’m all about enthusiasm and engagement. One reason is that I wanted to be inclusive in choosing a term so as not to be skewed significantly by gender, race, age, class, or other category. Anyone can be enthusiastic or detached when performing their voice, and either choice can be rhetorically effective. Roman Mars, as a vocally enthusiastic podcast host performs his delivery appropriately. Just as Nick van der Kolk performs his delivery appropriately on the detached end of the spectrum. (09:16) I’ve labeled the low end detached because these hosts aren’t unenthusiastic or unengaged in that they can't muster enthusiasm or engagement about their subjects, but they are detached, in that they perform a seemingly more objective or evenhanded delivery. That is to say, those on the low end of the spectrum are still engaged, but it is a detached engagement. Enthusiastic hosts carry more emotion in their voices, they might share more personal details, and they react to the stories they share more openly. (09:52) Again, the same caveat applies that I put on vocal presence: podcasts ebb and flow across episodes with some hosts more vocally engaged at some times than others, possibly due to the topic of episode or its invention. For example, Roman Mars might laugh and talk along in an episode about sound design in scary movies (99% Invisible, 2015), but be more somber in the episode about stealing bricking from abandoned houses in St. Louis (99% Invisible, 2017). (10:18) Truthfully, vocal engagement is a more subjective criterion than vocal presence, because there is little way to quantify it and listener reactions differ regarding what makes a voice enthusiastic or detached. But at its heart, rhetoric is a subjective practice upon which different audiences might have diverse reactions, and delivery has always been subjective based on audience and social cues. (10:45) So, what I’ve done here is once again place them on a continuum with vocally detached on the left and vocally enthusiastic on the right. And, although other listeners might put an individual podcast on a different place on this continuum, I contend that the extremes will still be distinct. (11:03) So, I’ll direct your attention to the blue box chart. You’ll find on the detached end there is Song Exploder, Criminal, Love + Radio, and The Kitchen Sisters Present. I’ve also included a longer clip from the Criminal episode “Gill From London,” so you can hear what I mean by vocal detachment. 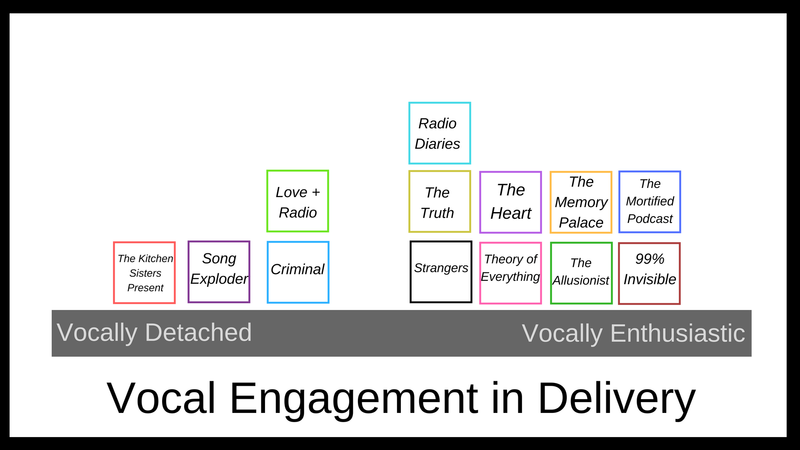 This chart visualizes 13 Radiotopia podcasts on the continuum of vocal engagement. Like vocal presence, the podcasts range across this continuum, although most are right of the center line. Clicking the links will take you to a new page where you can focus solely on listening. On the low end of the spectrum is Criminal, hosted by Phoebe Judge. Linked is a sample from the May 15, 2015, episode “Gill from London” (Criminal, 2015). In the middle of the spectrum is Strangers, hosted by Lea Thau. Linked is a sample from the April 14, 2014, episode “Love Hurts” (Strangers, 2015). At the high end of the spectrum is 99% Invisible, hosted by Roman Mars. Linked is a sample from the June 10, 2015, episode “All in Your Head” (99% Invisible, 2015). (11:20) On the enthusiastic end, on the right, is The Memory Palace, The Allusionist, Mortified, and 99% Invisible. I’ve embedded a longer clip of “All in Your Head” as representative of what I mean by vocal enthusiasm. (11:36) And, as evidence of the middle ground of the continuum, I’ve included a portion of the episode “Love Hurts” from Strangers, hosted by Lea Thau. (11:47) So you might take a moment, pause this, listen to those, get a sense of what I mean by detached versus enthusiastic and decide if you agree with me. (11:57) Now, once the two metrics of vocal presence and vocal engagement were identified, I began to graph them, using my isolated placements of vocal presence as the x-axis, and my placement of vocal engagement as the y-axis, and then drawing conclusions about where different podcasts fall when we put those two ideas together. You’ll find that analysis and further conclusions in the Sonic Ecology section, although I include the graph here in the blue box so you can look at it now. (12:30) Thank you for listening. Goodbye. This graph uses the placements of vocal presence as the x-axis and the placements of vocal engagement as the y-axis. The results will be explored in the Sonic Ecology Section.